Celiac.com 08/17/2015 - In an interesting update, researcher Giuseppe Mazzarella, of the Immuno-Morphology Lab at the Institute of Food Sciences of the National Council Research in Avellino, Italy recently set out to examine the role of effector and suppressor T cells in celiac. Celiac disease is a T-cell-mediated immune disorder in which gliadin-derived peptides activate lamina propria effector CD4+ T cells. This activation triggers the release of cytokines, compatible with a Th1-like pattern, which play a crucial role in the development of celiac disease, and which control many aspects of the inflammatory immune response. Previous studies revealed that a novel subset of effector T cells, marked by expression of high levels of IL-17A, termed Th17 cells, plays a key role in celiac disease. Although these effector T cell subsets produce pro-inflammatory cytokines, which cause significant tissue damage in celiac sufferers, recent studies have suggested the existence of additional CD4(+) T cell subsets with suppressor functions. These subsets include type 1 regulatory T cells and CD25(+)CD4(+) regulatory T cells, expressing the master transcription factor Foxp3, which have important implications for the development and progression of celiac disease. World J Gastroenterol. 2015 Jun 28;21(24):7349-56. doi: 10.3748/wjg.v21.i24.7349. What Can We Learn from T-cell Repertoires in Refractory Celiac Disease? In plain English, would someone please explain what this information says. The majority of people who read this will no doubt ask " Is this a good thing?". How about next time another article like this comes around be aware that a lot of us who have celiac disease are always interested in new information that may someday make our lives tolerable. Genetically, there is no cure. But, any new drug, vaccine, pill, etc., that may help people in the future is always worth reading about. BTW, why does the medical profession not recommend a celiac disease test to men and women for the genetic markers of celiac disease before becoming pregnant????? Especially since Celiac Disease is more previlant? Had I known, I would not have had a child who also has Celiac Disease and passed it on to her two sons, my grandsons. The only warning she had was after I had been diagnosed in my early 50's. Mine was switched "on" by the double pneumonia. Hers was turned "on" by a kidney infection. One son had his turned "on" from a bacterial infection. Her youngest is showing signs as well. Just Asking!!!!! Celiac.com 05/16/2012 - Goblet cells that line the intestine and secrete mucous are emerging as a possible target for treating inflammatory bowel disease, celiac disease and food allergies. With every meal, immune cells in the intestine stand guard against harmful bacteria but permit vitamins and nutrients to pass. The small intestine is protected from harmful pathogens by a layer of mucus secreted from goblet cells. A research team at Washington University School of Medicine in St. Louis have identified the cells that protect the intestine against food antigens, or proteins so that the immune system does not begin an attack. The discovery of goblet cells in mice shines new light on their role in the lining of the intestine, and gives scientists a potential target for treatments against inflammatory bowel disease, celiac disease and food allergies. To accomplish their task, the researchers used a new imaging technique that allows them to observe the inner workings of the intestine in a living mouse in real time. For their study, they fed marked sugar to mice and observed antigens as they were passed by goblet cells to dendritic cells. 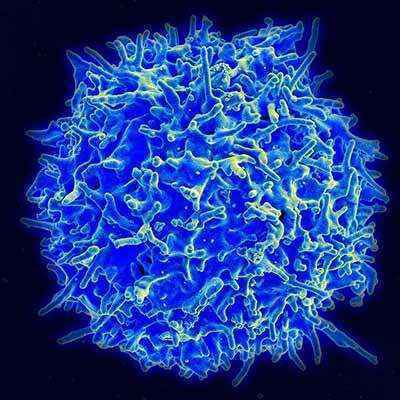 Dendritic cells play a key role in the immune system. But until now, scientists thought that intestinal goblet cells were only responsible for secreting mucus. Miller and Newberry also studied healthy human intestinal tissue from patients undergoing weight-loss surgery. Those results showed that goblet cells perform the same function in people as in mice. This indicates that the cells may be solid drug targets for treating inflammatory bowel disease and other intestinal problems. After studying normal, healthy mice, the researchers are now using the same imaging technique to look at how goblet cells and dendritic cells might function differently when inflammation or infection occurs. They also plan to study mucus-producing goblet cells in other tissues, such as the lung, to assess whether they are working the same way elsewhere in the body. Miller says the results are important because they help scientists understand that intestinal immune responses may depend as much on the ability of goblet cells to transport antigens to dendritic cells as on what the dendritic cells then do with those antigens. Nature. 2012 Mar 14;483(7389):345-9. doi: 10.1038/nature10863. Celiac.com 12/05/2012 - Regulatory T cells (Tregs) are play a pivotal role in helping our bodies tolerate self-antigens and dietary proteins. Interleukin (IL)-15 is a cytokine that is overly present in the intestines of patients with celiac disease. Studies have shown that Interleukin (IL)-15 does not interfere with the generation of functional Tregs, but causes human T cells to resist Treg suppression. To better understand how control of effector T cells by regulatory T cells is inhibited, a team of researchers compared Treg numbers and responses of intestinal and peripheral T lymphocytes to suppression by Tregs in celiac disease patients and in a control group. The research team included N.B. Hmida, M. Ben Ahmed, A. Moussa, M.B. Rejeb, Y. Said, N. Kourda, B. Meresse, M. Abdeladhim, H. Louzir, and N. Cerf-Bensussan. They are affiliated with the Department of Clinical Immunology and the Institut Pasteur de Tunis in Tunis, Tunisia. For their study, the team isolated intraepithelial lymphocytes (IELs) and lamina propria lymphocytes (LPLs) from duodenal biopsy specimens of patients with celiac disease and in a control group. The team then purified CD4+CD25+ T lymphocytes (Tregs) from blood. By analyzing anti-CD3-induced proliferation and interferon (IFN)-γ production in the presence or absence of peripheral Tregs, they were able to test responses of IELs, of LPLs, and peripheral lymphocytes (PBLs) to suppression by Tregs. The team used flow cytometry to measure lamina propria and peripheral CD4+CD25+FOXP3+ T cells. They found that, although patients with active celiac disease showed significantly increased percentages of CD4+CD25+FOXP3+ LPLs, they also showed less inhibited proliferation and IFN-γ production of intestinal T lymphocytes by autologous or heterologous Tregs (P < 0.01). IEL for subjects with celiac disease showed no response to Tregs. Also, the team noted resistance of LPLs and PBLs to Treg suppression in patients with villous atrophy who had substantially higher blood levels of IL-15 compared with patients without villous atrophy and controls. From their results, the research team concludes that effector T lymphocytes in people with active celiac disease become resistant to suppression by Tregs. This resistance may result in loss of tolerance to gluten, and to self-antigens. Am J Gastroenterol. 2012 Apr;107(4):604-11. doi: 10.1038/ajg.2011.397. Epub 2011 Nov 22. Celiac.com 04/24/2013 - Doctors classify refractory celiac disease (RCD) depending on the presence or absence of monoclonal expansions of intraepithelial lymphocytes (IELs) with an aberrant immunophenotype. A team of researchers recently set out to determine whether IEL parameters have any connection with mortality and morbidity in cases of refractory celiac disease. The research team included C. Arguelles-Grande, P. Brar, P. H. Green, and G. Bhagat. They are variously affiliated with the Celiac Disease Center, and the Departments of Medicine, Pathology and Cell Biology, at Columbia University Medical Center in New York, NY. The team used immunohistochemistry to assess IEL phenotype and polymerase chain reaction to determine T-cell receptor (TCR) gene rearrangement in 67 patients with RCD type I, and six patients with RCD type II. They considered a monoclonal TCR gene rearrangement and presence of greater than 50% CD3 CD8 IELs to be abnormal. They used Kaplan-Meier and Cox proportional hazard analyses to determine the time to worsening of clinical symptoms and the predictors of worsening. The team found 30 patients with less than 50% CD3 CD8 IELs, and eight with monoclonal TCR rearrangements. Three patients died and 40 suffered clinical worsening despite treatment. Estimated 5-year survival rates were 100% in patients with greater than 50% CD3 CD8 IELs and polyclonal TCR, but just 88% in patients with less than 50% CD3 CD8 IELs and 50% in patients with monoclonal TCR. All patients with monoclonal TCR gene rearrangement with less than 50% CD3 CD8 IELs showed shorter average time to clinical worsening of symptoms (11 mo), when compared to patients with less than 50% CD3 CD8 IELs alone (21 mo), polyclonal TCR (38 mo), or greater than 50% CD3 CD8 IELs alone (66 mo). After the team adjusted for age and gender, they found that the presence of less than 50% CD3 CD8 IELs was the only factor associated with increased risk for clinical worsening, despite negative celiac blood screens (hazard ratio=4.879; 95% confidence interval, 1.785-13.336; P=0.002). This means that RCD patients with <50% CD3 CD8 IELs are at risk for clinical worsening, and that RCD patients who also show monoclonal TCR gene rearrangement have higher mortality rates. Overall, the assessment of IEL phenotype and TCR gene rearrangement can provide important information regarding morbidity and risk of death in cases of RCD. J Clin Gastroenterol. 2013 Mar 6. Celiac.com 06/20/2014 - Celiac disease is a T cell–mediated disease triggered by the protein in wheat gluten. More than 9 out of 10 of people with celiac disease carry human leukocyte antigen (HLA)-DQ2 locus. A team of researchers recently set out to determine if T-cell receptor recognition of HLA-DQ2–gliadin complexes was connected with celiac disease. The researchers included Jan Petersen, Veronica Montserrat, Jorge R Mujico, Khai Lee Loh, Dennis X Beringer, Menno van Lummel, Allan Thompson, M Luisa Mearin, Joachim Schweizer, Yvonne Kooy-Winkelaar, Jeroen van Bergen, Jan W Drijfhout, Wan-Ting Kan, Nicole L La Gruta, Robert P Anderson, Hugh H Reid, Frits Koning, and Jamie Ross. They are variously affiliated with the Department of Biochemistry and Molecular Biology at the School of Biomedical Sciences, and the Australian Research Council Centre of Excellence in Advanced Molecular Imaging at Monash University in Clayton, Victoria, Australia, the Department of Pediatrics, and the Department of Immunohematology and Blood Transfusion at Leiden University Medical Center in Leiden, The Netherlands, the Department of Microbiology and Immunology, Peter Doherty Institute for Infection and Immunity, at the University of Melbourne in Parkville, Victoria, Australia, ImmusanT, Inc., in Cambridge, Massachusetts, USA, and the Institute of Infection and Immunity at Cardiff University School of Medicine in Heath Park, Cardiff, UK. The team first determined T-cell receptor (TCR) usage and fine specificity of patient-derived T-cell clones specific for two epitopes from wheat gliadin, DQ2.5-glia-α1a and DQ2.5-glia-α2. They also determined the ternary structures of four distinct biased TCRs specific for those epitopes. They were able to establish a basis for the biased TCR usage through mutagenesis and affinity measurements, together with the fact that all three TCRs specific for DQ2.5-glia-α2 docked centrally above HLA-DQ2. They found that a non–germline–encoded arginine residue within the CDR3β loop served as key of this common docking footprint. Although the TCRs specific for DQ2.5-glia-α1a and DQ2.5-glia-α2 docked similarly, their interactions with the respective gliadin determinants differed markedly, thereby providing a basis for epitope specificity. This is the first time a research team has determined that T-cell receptor recognition of HLA-DQ2–gliadin complexes was connected with celiac disease. Further study is needed to better understand the nature of their relationship.